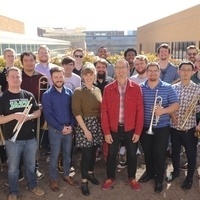 Directed by Alan Baylock, the One O’Clock Lab Band is the premier performing ensemble of the internationally acclaimed University of North Texas jazz studies program. We are honored to welcome them for a three-day residency as part of our DownBeat Education Days. With an unprecedented seven Grammy nominations resulting from the library of more than 50 critically acclaimed recordings to date, the One O’Clock Lab Band is noted for exceptional individual musicianship and tight ensemble performance. See them perform a public concert on the first evening of our Education Days, April 9. Doors open at 7 p.m., concert at 7:30 p.m. Tickets are $15 and seating is first come, first served. I had applied for the admission in the University of North Texas and pay the admission fee at https://paperleaf.ca/dissertation-writing-services/ now waiting for the admission letter then will go to the university. How do i clear clipboard history in my computer,friends this is good platform,here the fully guide help you any issue https://clipboardwindows10.com/ today discussed in this post,how to view and remove all clipboard history.